If you intend to stay in Germany for any serious period of time (more than 3 months) you – as a German, EU Citizen, foreigner alike – must register your official address with immigration authorities within 7 days of arrival. An amendment made in November 2015 requires your landlord or address owner to complete a component of the registration. This is a serious problem for new arrivals to Germany without permanent accommodation (e.g. hotel, hostels, couch-surfing) as Confirmation of registration of address (Anmeldung) is a requirement for visa applications in Germany and visa applications may be refused if not provided. The recent amendment means hotel and hostel owners will be unwilling to complete the required component of this registration as they will be legally responsible for forwarding mail from the German authorities to you, even after you’ve checked-out. You cannot use a business address or post office box. To resolve this you need to clarify to the immigration official in your registration appointment that you do not yet have a permanent address and will provide your current address (wherever you are currently staying, hotel, hostel, private) and will provide an updated official address before or at the time of your visa application. Regarding the required document to be filled by the landlord or address owner, date and sign the bottom section on the second page in your name but do not complete it. Do this after speaking to the immigration official as this is a very informal method for processing your registration and raises denials and frowns from immigration officials before being accepted. Hello, I am staying at a friend’s place on their couch as I have not yet found a permanent place to stay. My friend has written a letter stating that I am staying there for time being whilst I look for something more permanent. She doesn’t however want to put her landlord’s details down as it may be seen as subletting. What are my options here? She is going to come down to the office with me and speak with the officer.. do you think I am a chance of getting some kind of temporary anmeldung which I can use to sort my working visa out? I don’t really want to have to go and pay for a hotel/hostel booking when I am staying here without fee. Any guidance would be hugely appreciated. Hi Zach, your best bet is to go down together and explain that you will use your temporary address (without the landlord’s details) and submit another registration of address when you do have permanent accommodation. 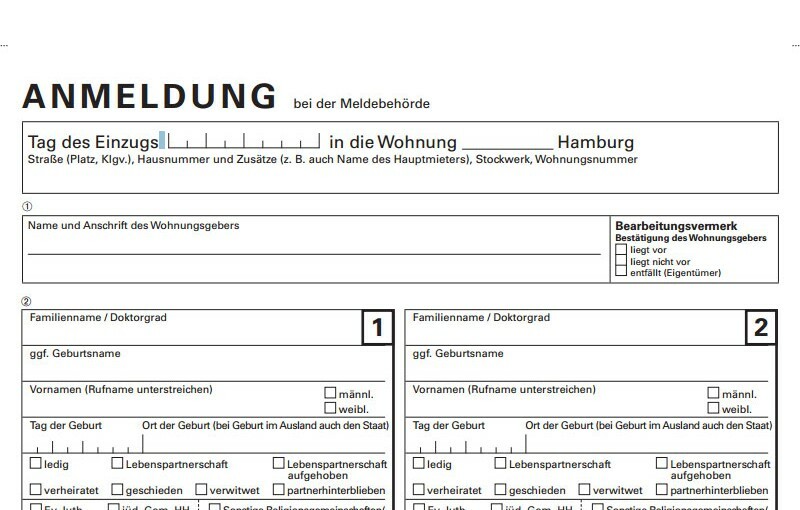 I’ve been issued a temporary Anmeldung when I was staying at a local hostel and re-registered once I found an apartment. Be patient and apologetic with immigration (they’re bending the rules for you), most of all don’t lose your temper. Keep at it! Hi, once you have your residency permit, does this also grant you permission to travel to any Schengen country for longer than 90 days? I’ll be spending a fair bit of time in Germany but will need longer than 90 days to see the rest of Europe. Hi Emma, it sure does! As long as your German residence visa is valid you will have unrestricted travel within EU/EEA nations (aka Schengen zone) till its expiry. What you can do at the end of your residence visa (e.g. a Working Holiday visa) is request an additional temporary visa which will give you up to 90 days stay in Germany till you arrange your next visa in Germany or a neighbouring country. So I’m in the process of doing this on monday, I’m to go to a burgeramt an hour before they open and pray they give me an appointment. So you just took in your registration form & passport and told them you would update your address after your visa application? Did they ask for any proof you were staying at the hostel? Maybe I will bring a booking confirmation. Can you recommend a good burgeramt that might be more likely to take a walk in. I’m desperate to sort this out asap, because my visa expires on monday and I just need to get this address registered to apply for the working holiday. I’m Australian. Everything else I’m reading online is saying that you need written confirmation from a landlord..
Bring your passport, booking confirmation and tell them the hostel won’t sign it and that you’ll submit your new address as soon as you find an apartment. Keep pushing, and go even earlier than you’re planning as the popular registration offices will take walk-in’s for an hour or so until they have to take the appointments. Good luck!